I’ve been listening to tons of Detroit house these days, but since I’m still catching up on the classics, my reviews have been spotty. 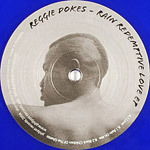 Luckily, Infinitestatemachine tipped me to the new Reggie Dokes 12-inch, and it is, simply put, a masterpiece. All three tracks are beautiful. On “Love,” bongos pong and synth strings squelch, pushed near clipping, but somehow they’re both incredibly moving. It is truly a love song, and it’s over before you know it. “Rain on Me” features piano, strings, and saxophone over a primitive drum machine and a synthesizer bassline. It’s an unexpected combination, making for a deep, soulful sound. When the synth melody soars in, it’s a heavenly experience. “Black Children of the Ghetto” is the most downtempo tune, with polyrhythmic drums and electric piano. The melody is not as strong, but the vibe is meditative. If I were to extend my list of deep, instrumental house past the nineties, there’s no doubt this EP would get a place amongst the classics. Nice blog, cz! I’ll add you to my links. cool, thanks! i’ve done likewise.